e-Statements ... For security. For convenience. For FREE! Reduce the stacks and clutter by switching to e-Statements in Online Banking. 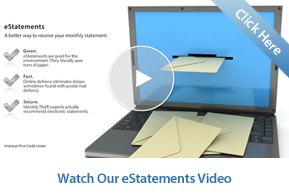 Click on the account that you would like to receive e-Statements. Click on the “Statements” link to the right of the account tile. Accept the e-Statement Service Agreement. Click on the account tile that you would like to view. Simply the best way to view and manage your statements. Convenient — Review your statements and cancelled checks online at any time - day or night. Green — e-Statements are good for the environment. They literally save a ton of paper. Fast — Online delivery eliminates delays sometimes found with postal mail delivery. Secure — Your e-Statements are protected by the latest security measures. Identity Theft experts recommend electronic statements.